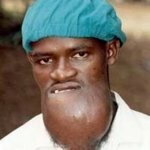 The tumour on Patrick’s chin was the largest ship surgeons had tackled to date. But the outbreak of a decade-long Civil War in Sierra Leone interrupted his follow-up treatment. The enormous tumour began as a small lump on his chin when Patrick was a child. 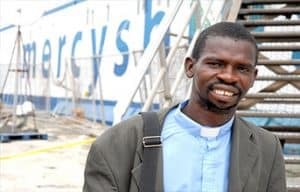 He endured ridicule and rejection until, as a young man, he made his way to the Mercy Ship in 1993. The growth was the largest the ship surgeons had operated on, up to that time. The surgical team removed the tumour and affected portions of his lower jaw. But as he required further surgery, Patrick disembarked with an appointment card in his hand ready for the ship’s next visit. Then civil war broke out in Sierra Leone. Rebels held the nation to ransom and caused destruction for ten long years. 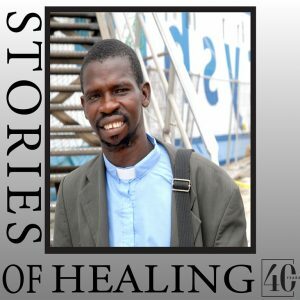 When the Anastasis was finally able to return to Freetown in 2001, Patrick had married and was now the father of three children. He had story after story to tell of that horrific time and the way God had kept him and his family safe through nightmare conditions. Patrick received his follow up surgeries on board that completed his facial reconstruction.